Indicate by check mark whether the registrant is a large accelerated filer, an accelerated filer, or a non-accelerated filer, a smaller reporting company, or an emerging growth company. See the definitions of “large accelerated filer,” “accelerated filer,” “smaller reporting company” and "emerging growth company" in Rule 12b-2 of the Exchange Act. The aggregate market value of Common Stock held by non-affiliates of the registrant (based upon the closing sale price on the New York Stock Exchange as of May 31, 2018, the last business day of the registrant’s most recently completed second fiscal quarter) was $3,190,444,534. Shares held by each executive officer, director and by each person who owns 10% or more of the outstanding Common Stock have been excluded in that such persons may be deemed to be affiliates. This determination of affiliate status is not necessarily a conclusive determination for other purposes. As of January 22, 2019, there were 51,226,589 shares of Common Stock, $0.001 per share par value, outstanding. Items 10 (as to directors and Section 16(a) Beneficial Ownership Reporting Compliance), 11, 12 (as to Beneficial Ownership), 13 and 14 of Part III incorporate by reference information from the registrant’s proxy statement to be filed with the Securities and Exchange Commission in connection with the solicitation of proxies for the registrant’s 2019 Annual Meeting of Stockholders to be held on March 15, 2019. When used in this Annual Report on Form 10-K (this “Report”), the words “believes,” “estimates,” “expects,” “intends,” “allows,” “can,” “may,” “could,’’ “designed,” “will,” and similar expressions are intended to identify forward-looking statements. These are statements that relate to future periods and include statements about market trends, our business model and our services, our business and market strategy, future growth, including expansion of our product and service lines, our infrastructure, our investment in our information technology, or IT, systems, our employee hiring and retention, the ownership interest of MiTAC Holdings Corporation, or MiTAC Holdings, in us and its impact, our revenue, sources of revenue, our gross margins, our operating costs and results, timing of payment, the value of our inventory, our competition, including with Synnex Technology International Corp., our future needs for additional financing, the likely sources for such funding and the impact of such funding, concentration of customers and suppliers, customer and supplier contract terms, customer forecasts and its impact on us, relationships with our suppliers, adequacy of our facilities, ability to obtain comparable leases, our data center and contact center operations, use of technology at contact centers, ability to manage and communicate with international resources, scalability of customer management solutions, ability to meet demand, managing inventory and our shipping costs, our legal proceedings, our operations and trends related thereto, our international operations, foreign currency exchange rates and hedging activities, expansion of our operations and related effects, including our Concentrix business, our strategic acquisitions and divestitures of businesses and assets, including our acquisition of Convergys, the successful integration of Convergys, costs related to the acquisition and the impact of the acquisition on our business, revenue, cost of revenue and gross margin, our goodwill, seasonality of sales, changes in share price, adequacy of our cash resources to meet our capital needs, our debt and financing arrangements, cash held by our foreign subsidiaries and repatriation, changes in fair value of derivative instruments, our tax liabilities, adequacy of our disclosure controls and procedures, dependency on personnel, pricing pressures, cybersecurity and compliance with related rules and regulations, impact of rules and regulations affecting public companies, impact of our pricing policies, impact of economic and industry trends, changes to the markets in which we compete, impact of our accounting policies and recently issued accounting pronouncements, impact of inventory repurchase obligations and commitments and contingencies, our effective tax rates, impact of any impairment of our goodwill and intangible assets, our share repurchase and dividend program, our securitization programs, term loans and revolving credit lines, our investments in working capital, and personnel and our succession planning. Forward-looking statements are subject to risks and uncertainties that could cause actual results to differ materially from those projected. These risks and uncertainties include, but are not limited to, those risks discussed herein, as well as the seasonality of the buying patterns of our customers, concentration of sales to large customers, dependence upon and trends in capital spending budgets in the IT, and consumer electronics, or CE, industries, fluctuations in general economic conditions, change in market for our customers' products, employee turnover, changes in value of foreign currencies and interest rates and other risk factors contained below under Part I, Item 1A, “Risk Factors.” These forward-looking statements speak only as of the date hereof. We expressly disclaim any obligation or undertaking to release publicly any updates or revisions to any forward-looking statements contained herein to reflect any change in our expectations with regard thereto or any change in events, conditions or circumstances on which any such statement is based. In the sections of this Report entitled “Business” and “Management’s Discussion and Analysis of Financial Condition and Results of Operations,” all references to “SYNNEX,” “we,” “us,” “our” or the “Company” mean SYNNEX Corporation and its subsidiaries, except where it is made clear that the term means only the parent company or one of its segments. We are a Fortune 200 corporation and a leading business process services company, providing a comprehensive range of distribution, logistics and integration services for the technology industry and providing outsourced services focused on customer engagement to a broad range of enterprises. We are organized to provide our products and services through two reportable business segments: Technology Solutions and Concentrix. Our Technology Solutions segment distributes peripherals, IT systems including data center server and storage solutions, system components, software, networking, communications, security equipment, consumer electronics, or CE, and complementary products. Within our Technology Solutions segment, we also provide systems design and integration solutions. Our Concentrix segment offers a portfolio of technology-enabled strategic solutions and end-to-end business services focused on customer engagement, process optimization, technology innovation, front and back-office automation and business transformation to clients in ten identified industry verticals. from our suppliers and sell them to our reseller and retail customers. We perform a similar function for our distribution of licensed software products. Our reseller customers include value-added resellers, or VARs, corporate resellers, government resellers, system integrators, direct marketers, and national and regional retailers. We combine our core strengths in distribution with demand generation, supply chain management and design and integration solutions to help our customers achieve greater efficiencies in time to market, cost minimization, real-time linkages in the supply chain and after-market product support. We also provide comprehensive IT solutions in key vertical markets such as government and healthcare and we provide specialized service offerings that increase efficiencies in the areas of print management, renewals, networking, logistics services and supply chain management. Additionally, we provide our customers with systems design and integration solutions for data center servers and networking solutions built specific to our customers’ workloads and data center environments. Our Technology Solutions business is characterized by low gross profit as a percentage of revenue, or gross margin, and low income from operations as a percentage of revenue, or operating margin. The market for IT and CE products is generally characterized by declining unit prices and short product life cycles. We set our sales price based on the market supply and demand characteristics for each particular product or bundle of products we distribute and services we provide. In our Technology Solutions segment, we are highly dependent on the end-market demand for IT and CE products, and on our partners’ strategic initiatives and business models. This end-market demand is influenced by many factors including the introduction of new IT and CE products and software by OEMs, replacement cycles for existing IT and CE products, trends toward cloud computing, overall economic growth and general business activity. A difficult and challenging economic environment may also lead to consolidation or decline in the IT and CE industries and increased price-based competition. In our Concentrix segment, we provide a comprehensive range of strategic services and solutions to enhance our clients’ customer life cycles to acquire, support and renew customer relationships, to automate and optimize processes, to maximize the value of every customer interaction and to improve business outcomes. Our portfolio of services includes end-to-end process outsourcing to customers in various industry vertical markets delivered through omni-channels that include both voice and non-voice mediums and in more than 70 languages. Our portfolio of solutions and services support our clients and their customers globally. In the fourth quarter of fiscal year 2018, we acquired Convergys Corporation ("Convergys"), which added scale, diversified our revenue base, expanded Concentrix' delivery footprint and strengthened Concentrix' leadership position as a top global provider of customer engagement services. Our Concentrix segment generates revenue from performing services that are generally tied to our clients’ products and services and how they are received in the marketplace. Any shift in business or size of the market for our customers’ products, any failure of technology or failure of acceptance of our customers’ products in the market may impact our business. The employee turnover rate in this business and the risk of losing experienced employees is high. Higher turnover rates can increase costs and decrease operating efficiencies and productivity. We have been in business since 1980 and are headquartered in Fremont, California. We have significant operations in North and South America, Asia-Pacific and Europe. We were originally incorporated in the State of California as COMPAC Microelectronics, Inc. in November 1980, and we changed our name to SYNNEX Information Technologies, Inc. in February 1994. We later reincorporated in the State of Delaware under the name of SYNNEX Corporation in October 2003. As of November 30, 2018, we had over 230,000 full-time and temporary employees worldwide. Financial information by segment is provided in our Consolidated Financial Statements included elsewhere in this Report. In our Technology Solutions segment, we distribute a broad line of IT products, including peripherals, IT systems, system components, software, security, UCC and networking equipment from more than 400 OEM suppliers, enabling us to offer comprehensive solutions to our reseller and retail customers. Our product offerings also include systems design and full rack integration solutions, build-to-order, and configure-to-order assemblies. Our Technology Solutions segment represented 88%, of our consolidated revenue in fiscal years 2018 and 2017, respectively, and 89% of our consolidated revenue in fiscal year 2016. Our suppliers include leading peripherals, IT systems, system components, software, security, networking equipment, UCC and CE manufacturers. Our primary OEM suppliers are Alphabet Inc. (Google), Asus Tek Computer Inc., Cisco Systems, Inc., HP Inc. (“HP”), Hewlett Packard Enterprise Company, Intel Corporation, Lenovo Group Ltd, Microsoft Corporation, Panasonic Corporation, and Samsung Semiconductor Inc.
Our largest OEM supplier is HP. Revenue from the sale of products and services provided by HP represented approximately 12%, 13% and 17% of our consolidated revenue for fiscal years 2018, 2017 and 2016, respectively. As is typical with our OEM supplier agreements, our United States Business Development Partner Agreement with HP is short-term and may be terminated without cause upon short notice. In the event of any breach of the agreement by us, HP may terminate the agreement and we may be required to refund HP any discounts or program payments paid during the period we were in breach of the agreement and reimburse HP for reasonable attorneys’ fees. In the event the agreement is terminated for cause or if we fail to perform our obligations under the agreement, our agreement with HP for the resale of products, support and services will automatically terminate upon such default or termination. If either party becomes insolvent or bankrupt, the other party may terminate the agreement without notice and cancel any unfulfilled obligations, except for payment obligations. Some of our subsidiaries also have territorial supplier agreements with subsidiaries of HP located in the respective countries. We have distribution agreements with most of our suppliers, including HP. These agreements usually provide for nonexclusive distribution rights and pertain to specific geographic territories. The agreements are also generally short-term, subject to periodic renewal, and often contain provisions permitting termination by either our supplier or us without cause upon relatively short notice. An OEM supplier that elects to terminate a distribution agreement will generally repurchase its products carried in our inventory. Our Technology Solutions business subjects us to the risk that the value of our inventory will be affected adversely by suppliers’ price reductions or by technological changes affecting the usefulness or desirability of the products comprising our inventory. Many of our OEM suppliers offer us limited protection from the loss in value of our inventory due to technological change or a supplier’s price reduction. Under many of these agreements, we have a limited period of time to return or exchange products or claim price protection credits. We monitor our inventory levels and attempt to time our purchases to maximize our protection under supplier programs. In our Technology Solutions segment, we distribute IT products to more than 25,000 resellers, system integrators and retailers. Resellers are classified primarily by their end-user customers. End-users include large corporations or enterprises, federal, state and local governments, small/medium sized businesses, or SMBs, and individual consumers. In addition, resellers vary greatly in size and geographic reach. Our reseller customers buy from us and other distributors. Our larger reseller customers also buy certain products directly from OEM suppliers. System integrators offer services in addition to product resale, primarily in systems customization, integration, and deployment. Retailers serve mostly individual end-users and to a small degree, small office/home office customers. We also provide systems design and integration solutions for data center servers built for our customers’ data center environments. In our Concentrix segment, we serve over 650 clients in ten industry verticals: automotive, banking & financial services, consumer electronics, energy & public sector, healthcare, insurance, media & communications, retail & e-commerce, technology, and travel, transportation & tourism. We focus on developing long-term, strategic relationships with large companies in these customer-intensive industry verticals to benefit from the complexity of services required, the anticipated growth of their market segments and their increasing need for more cost-effective customer engagement services. In fiscal years 2018, 2017 and 2016, one customer accounted for 17%, 21% and 12%, respectively, of our consolidated revenue. We do not believe that the loss of any single customer would have a material adverse effect on the Company and its subsidiaries taken as a whole. Technology Solutions. We have sophisticated pick, pack and ship operations, which allows us to efficiently receive shipments from our OEM suppliers and quickly fill orders for our reseller and retail customers. We generally stock or otherwise have access to the inventory of our OEM suppliers to satisfy the demands of our reseller and retail customers. In addition, we design and integrate energy efficient and cost effective data center servers which are built specific to the data center environments and actual workloads of our large scale data center customers. Systems Design and Integration Solutions. We provide our customers with systems design and full rack integration solutions, build-to-order, and configure-to-order assembly capabilities. In both of these cases, we offer design, integration, test and other production value-added solutions such as thermal testing, power-draw efficiency testing, burn-in, quality and logistics support. Logistics Services. We provide logistics support to our reseller customers such as outsourced fulfillment, virtual distribution and direct ship to end-users. Other logistics support activities we provide include generation of customized shipping documents, multi-level serial number tracking for customized, configured products and online order and shipment tracking. We also offer full turn-key logistics solutions designed to address the needs of large volume or specialty logistics services. Our full turn-key service offering is modular in nature and is designed to cover all aspects of the logistics life cycle including, transportation management, inventory optimization, complementary product matching, reverse logistics, asset refurbishment and disposal and strategic procurement. Cloud Services. We provide cloud-based solutions and services to our reseller customers to enable sales of and migration to technologies in a hosted environment to small and medium businesses. Our proprietary cloud platform offers a complete package of cloud-based solutions on a user-friendly platform and allows our reseller customers and OEM vendors to own the complete customer lifecycle through direct billing, provisioning, management, and support. Our solutions cover all end user customer needs, including, pure public cloud solutions in productivity and collaboration, IaaS, or Infrastructure as a Service, PaaS, or Platform as a Service, SaaS, or Software as a Service, Security, Mobility, IoT, or Internet of Things, and other hybrid solutions. Our dedicated cloud team comprising developers, sales engineers and solutions specialists, supports our reseller customers in the sales of these solutions. Online Services. We maintain electronic data interchange, or EDI, extensible markup language, or XML, web-based communication links and mobile applications with many of our reseller and retail customers. These links improve the speed and efficiency of our transactions with our customers by enabling them to search for products, check inventory availability and prices, configure systems, place and track orders, receive invoices, review account status and process returns. We also have web-based application software that allows our customers or their end-user customers to order software and take delivery online. Financing Services. We offer our reseller customers a wide range of financing options, including net terms, third party leasing, floor plan financing and letters-of-credit backed financing and arrangements where we collect payments directly from the end-user. We also lease products to our reseller customers and their end-users and provide device-as-a-service to end users. The availability and terms of our financing services are subject to our credit policies or those of third party financing providers to our customers. Marketing Services. We offer our OEM suppliers a full range of marketing activities targeting resellers, system integrators and retailers including direct mail, external media advertising, reseller product training, targeted telemarketing campaigns, national and regional trade shows, trade groups, database analysis, print on demand services and web-based marketing. Concentrix. Our Concentrix segment represented 12% of our consolidated revenue in fiscal years 2018 and 2017, respectively, and 11% in fiscal year 2016. We offer a portfolio of technology-enabled comprehensive solutions and end-to-end business outsourcing services to approximately 650 customers around the world in ten identified industry verticals. rebate management as a few examples. We also provide services that provide feedback to our clients. This is provided through a dedicated team of professionals to deliver data-driven insights to our clients to improve the customer experience through analytics and consulting, and software solutions, such as, Enterprise Feedback Management/Multi-channel, Voice of Customer Software, Integrated Customer Experience Analytics, Post-Contact Surveys, Relational Loyalty Research, Customer Segmentation and Profiling, Call Elimination Analysis, Analysis of Customer Effort, Digital Channel Optimization, and Integrated Contact Center Analytics. Marketing Solutions. Our services include data-driven customer acquisition and retention marketing solutions across digital, social, mobile and print channels that help our clients manage their marketing through a diverse distribution channel enabling each constituent in the channel to participate in targeting end customers with the right brand engagement. Much of these data are collected from connected cars, devices as part of IoT and location beacons on behalf of our clients. We also support our clients loyalty and incentive programs, event administration, point of purchase and targeted lifecycle messaging to customers through services as described in our Customer Lifecycle Management services. Third Party Administration of Insurance Policies. We are a licensed Third Party Administrator of certain types of insurance policies that are managed through our proprietary insurance management system as well as other third party systems. The services are provided primarily in the United States. Enterprise Mobile Development. We provide mobile application development across multiple industries for both IOS and Android devices that are focused on Enterprise deployments through our Tigerspike business. Services within this group include UX/UI designed/development, optimization of applications and movement of on-premise systems to the cloud. Automation and Process Optimization. We deliver focused front office solutions with workflows and macro/desktop automation that drive improved staff efficiency, and implement cognitive systems/robotic process automation to replace manual touch points. These services use both internal technology assets as well as third party tools. Technology Assets. We license a number of our technology assets without being bundled with services which enable our clients to be more efficient, drive higher visibility to data and identify valuable customer patterns and insights from enterprise data to design better customer engagement strategies. These assets are used within our portfolio of services as well. In our Technology Solutions segment, we serve our large commercial, government reseller, and retail customers through dedicated sales professionals. We market to smaller resellers and OEMs through dedicated regional sales teams. In addition, we have dedicated product management and business development specialists that focus on the sale and promotion of products and services of selected suppliers or for specific end-market verticals. These specialists are also directly involved in establishing new relationships with leading OEMs to create demand for their products and services and with resellers for their customers’ needs. We also have a direct sales approach for our design and integration solutions business. Our sales and marketing professionals are complemented by members of our executive management team who are integral in identifying potential new customer opportunities, promoting sales growth and ensuring customer satisfaction. We have sales and marketing professionals in close geographic proximity to our reseller, retail and OEM customers. In our Concentrix segment, we market our services through a sales force organized by industry vertical and geography. The length of our selling cycle varies depending on the type of engagement. Our efforts may begin in response to our lead generation program, a perceived opportunity, a reference by an existing client, a request for proposal or otherwise. The sales cycle varies depending on the type of services work as well as whether there is an existing relationship with the client. We have designated client partners or global relationship managers for each of our strategic relationships. The relationship manager is supported by process improvement, quality, transition, finance, human resources, information technology and industry or subject matter expert teams to ensure the best possible solution is provided to our clients. We also strive to foster relationships between our senior leadership team and our clients’ senior management. These “C-level” relationships ensure that both parties are focused on establishing priorities, aligning objectives and driving client value from the top down. High-level executive relationships have been particularly constructive as a means of increasing business from our existing clients. It also provides us with a forum for addressing client concerns. We constantly measure our client satisfaction levels to ensure that we maintain high service levels for each client. strategy enables us to benefit from lower shipping costs and shorter delivery lead times to our customers. Furthermore, we track several performance measurements to continuously improve the efficiency and accuracy of our distribution operations. Our regional locations also enable us to make local deliveries and provide will-call fulfillment to more customers than if our distribution operations were more centralized, resulting in better service to our customers. Our workforce is comprised of permanent and temporary employees, enabling us to respond to short-term changes in order activity. Our proprietary IT systems and processes enable us to automate many of our distribution operations. We use radio frequency and bar code scanning technologies in all of our warehouse operations to maintain real-time inventory records, facilitate frequent cycle counts and improve the accuracy of order fulfillment. To enhance the accuracy of our distribution order fulfillment and protect our inventory from shrinkage, our distribution systems also incorporate numerous controls. These controls include order weight checks, bar code scanning, and serial number profile verification. We also use digital video imaging to record our small package shipping activities by order. These images and other warehouse and shipping data are available online to our customer service representatives, enabling us to quickly respond to order inquiries by our customers. We operate our principal system design and integration solutions facilities in the United States and we operate integration facilities in the United Kingdom and China. We generally design and integrate IT systems, data center servers and networking solutions and IT appliances, by incorporating system components purchased directly from vendors or obtained from our distribution inventory. Additionally, we perform other production value-added services, including thermal testing, power-draw efficiency testing, burn-in, quality and logistics support. Some of our design and integration solutions facilities are ISO 9001:2015 and ISO 14001:2015 certified. In our Concentrix segment, we have global delivery capability which allows us to scale people and other resources from around the world, including foreign language fluency, proximity to clients and time-zone advantages. A critical component of this capability is our over 275 delivery and administrative centers in 40 countries throughout North and South America, Asia-Pacific, Europe and Africa. Our delivery centers improve the efficiency of our engagement teams through the reuse of processes, solution designs and infrastructure by leveraging the experience of delivery center professionals. Services are provided from these global locations to customers worldwide in multiple languages. These services are supported by proprietary technology to enable efficient and secure customer contact through various methods including voice, chat, web, email, social media and digital and mobility competencies by providing improved business intelligence and performance through enabling technologies. All of our legacy delivery centers are ISO 27001:2013 and PCI DSS (Payment Card Industry Security Standards Council's Data Security Standards) version 3.2 certified. Many of the acquired Convergys customer accounts are also certified to these standards. Twelve of our delivery centers around the world are certified to COPC (Customer Operation Performance Center) OSP standard. We operate a distributed data processing environment that can integrate service delivery center data servers and databases with thirty nine data centers and point of presence strategically located across the globe. Our technologically-advanced and secured data centers provide availability 24 hours a day, 365 days a year, with redundant power and communication feeds and emergency power back-up, and are designed to withstand most natural disasters. The capacity of our data center and contact center operations, coupled with the scalability of our customer management solutions, enable us to meet the changing needs of large-scale and rapidly growing companies and government entities. By employing the scale and efficiencies of common application platforms, we can provide client-specific enhancements and modifications without incurring many of the costs of a full custom application, which positions us as a value-added provider of customer support products and services. Approximately 28% of our consolidated revenue is generated by our international operations. Our end market strategy for our Technology Solutions business, while focused on the Americas, is expanding internationally on a selective basis in order to provide our distribution capabilities to OEMs in locations that meet their regional requirements. A key element in our business strategy has been to locate our Concentrix service delivery contact centers in markets that are strategic to our customer requirements and cost beneficial. We have significant operations in the Philippines and India. Sales and cost concentrations in foreign jurisdictions subject us to various risks, including the impact of changes in the value of these foreign currencies relative to the US Dollar, which in turn can impact reported sales. See Note 13 -- Segment Information to the Consolidated Financial Statements included in Item 8 of this Report for additional financial information related to foreign and domestic operations. Our operating results in the Technology Solutions segment are affected by the seasonality of the IT and CE products industries. We have historically experienced higher sales in our fourth fiscal quarter due to patterns in capital budgeting, federal government spending and purchasing cycles of our customers and end-users. These patterns may not be repeated in subsequent periods. Revenue in our Concentrix segment is typically the highest in our fourth fiscal quarter. In our Technology Solutions segment, product cost represents our single largest expense and IT and CE product inventory is one of our largest working capital investments. Furthermore, product procurement from our OEM suppliers is a highly complex process that involves incentive programs, rebate programs, price protection, volume and early payment discounts and other arrangements. Consequently, efficient and effective purchasing operations are critical to our success. Our purchasing group works closely with many areas of our organization, especially our product managers who work closely with our OEM suppliers and our sales force, to understand the volume and mix of IT products that should be purchased. In addition, the purchasing group utilizes an internally developed, proprietary information systems application tool that further aids in forecasting future product demand based on several factors, including historical sales levels, expected product life cycle and current and projected economic conditions. We may also rely on our receipt of good-faith, non-binding, customer forecasts. We maintain electronic data interchange, or EDI, connection with our OEM suppliers to send purchase orders, receive purchase order status and receive notification once the product has shipped from our supplier. Our information system tool also tracks warehouse and channel inventory levels and open purchase orders on a real-time basis enabling us to stock inventory at a regional level closer to the customer as well as to actively manage our working capital resources. This level of automation promotes greater efficiencies of inventory management by replenishing and turning inventory, as well as placing purchase orders on a more frequent basis. Furthermore, our system tool also allows for automated checks and controls to prevent the generation of inaccurate orders. Managing our OEM supplier incentive programs is another critical function of our purchasing and product management teams. We attempt to maximize the benefits of incentives, rebates and volume and early payment discounts that our OEM suppliers offer us from time to time. We carefully evaluate these supplier incentive benefits relative to our product handling and carrying costs so that we do not over-invest in our inventory. We also closely monitor inventory levels on a product-by-product basis and plan purchases to take advantage of OEM supplier provided price protection. By managing inventory levels and monitoring customer purchase patterns at each of our regional distribution facilities, we believe we can minimize our shipping costs by stocking products near our resellers and retailers, and their end-user customers. In our Technology Solutions segment, we offer various financing options to our customers as well as prepayment, credit card and cash on delivery terms. In providing credit terms to our reseller and retail customers, we closely and regularly monitor their creditworthiness through our information systems, credit ratings information and periodic detailed credit file reviews by our financial services staff. We have also purchased credit insurance in some geographies to further control credit risks. Finally, we establish reserves for estimated credit losses in the normal course of business based on the overall quality and aging of our accounts receivable portfolio, the existence of a limited amount of credit insurance and specifically identified customer risks. We also sell to certain reseller customers pursuant to third party floor plan financing. The expenses charged by these financing companies are subsidized either by our OEM suppliers or paid by us. We generally receive payment from these financing companies within 15 to 30 days from the date of sale, depending on the specific arrangement. Within our Technology Solutions segment, our IT systems manage the entire order cycle, including processing customer orders, customer billing and payment tracking. These internally developed IT systems make our operations more efficient and provide visibility into our operations. We believe our IT infrastructure is scalable to support further growth. We continue to enhance and invest in our IT systems to improve product and inventory management, streamline order and fulfillment processes, and increase operational flexibility. To allow our customers and suppliers to communicate and transact business with us in an efficient and consistent manner, we have implemented a mix of proprietary and off-the-shelf software programs that integrate our IT systems with those of our customers and suppliers. In particular, we maintain EDI, XML, web-based communication links and mobile platform applications with many of our reseller and retail customers to enable them to search for products, check real-time pricing, inventory availability and specifications, place and track orders, receive invoices and process returns. Within our Concentrix segment, we invest in IT systems, infrastructure, automation and security to enhance workforce management and improve productivity. Our contact centers can employ a broad range of technology, including digital switching, intelligent call routing and tracking, proprietary workforce management systems, case management tools, proprietary software systems, computer telephony integration, interactive voice response, advanced speech recognition, web-based tools and relational database management systems with embedded security. Our innovative use of technology enables us to improve our voice, chat, web and e-mail handling and personnel scheduling, thereby increasing our efficiency and enhancing the quality of the services we deliver to our clients and their customers. We are able to respond to changes in client call volumes and manage call volume traffic based on agent availability. Additionally, we can use this technology to collect information concerning the contacts, including number, response time, duration and results of the contact and report the information to the client on a periodic basis for purposes of monitoring quality of service and accuracy of billing. We operate in a highly competitive global environment. The IT product industry is characterized by intense competition, based primarily on product availability, credit terms, price, speed and accuracy of delivery, effectiveness of sales and marketing programs, ability to tailor specific solutions to customer needs, quality and depth of product lines, pre and post-sale technical support, flexibility and timely response to design changes, technological capabilities and product quality, service and support. We compete with a variety of regional, national and international IT product distributors and manufacturers. Our major competitors in our Technology Solutions segment include Arrow Electronics, Inc., Ingram Micro, Inc., ScanSource, Inc., and Tech Data Corporation and, to a lesser extent, regional distributors. We also face competition from our OEM suppliers that sell directly to resellers, retailers and end-users. The distribution industry has historically undergone, and continues to undergo, consolidation. Over the years, a number of providers within the IT distribution industry exited or merged with other providers. For example, during fiscal year 2017, we acquired the Westcon-Comstor Americas' distribution business and Tech Data Corporation acquired the Technology Solutions operating group of Avnet Inc. In 2016, Ingram Micro Inc. was acquired and became part of HNA Group. We have participated in this consolidation and expect to continue to assess opportunities. As we enter new business areas, we may encounter increased competition from our current competitors and/or new competitors. Some of our competitors are substantially larger and may have greater financial, operating, manufacturing and marketing resources than us. Some of our competitors may have broader geographic breadth and range of services than us. Some may have more developed relationships with their existing customers. We attempt to offset our comparative scale differences by focusing on a limited number of leading OEMs in the Technology Solutions segment, by running a more efficient and low cost operation, and by offering a high level of value-added and customer services in both the Technology Solutions and Concentrix segments. In our Concentrix segment, we operate in a highly competitive and rapidly evolving global marketplace. Our competitors are both regional players as well as global companies. Our major competitors include Accenture plc, Conduent Inc., Genpact Limited, Globant S.A., SITEL Worldwide Corporation (a wholly-owned subsidiary of Groupe Acticall), Sykes Enterprises Inc., Teleperformance S.A., TTEC Holdings, Inc., and Transcosmos Inc. In the future, we may face greater competition due to the consolidation of business process outsourcing providers. Consolidation activity may result in competitors with greater scale, a broader footprint or more attractive pricing than ours. In addition, a client or potential client may choose not to outsource its business, by setting up captive outsourcing operations or by performing formerly outsourced services for themselves, or may switch customer care providers. We constantly seek to expand our business into areas primarily related to our core distribution and outsourced business services as well as other support, logistics and related value-added services, both organically and through strategic acquisitions. As of November 30, 2018, we had approximately 229,000 full-time employees. Given the variability in our business and the quick response time required by customers, it is critical that we are able to rapidly ramp-up and ramp-down our operational capabilities to maximize efficiency. As a result, we use temporary or contract workers, who totaled approximately 2,600, on a full-time equivalent basis, as of November 30, 2018. Except for a small number of our employees in certain countries, generally required by local regulations or brought in through acquisitions, our employees are not represented by a labor union, nor are they covered by a collective bargaining agreement. We consider our employee relations to be good. Our website is http://www.synnex.com. We make available free of charge, on or through our website, our Annual Report on Form 10-K, quarterly reports on Form 10-Q, current reports on Form 8-K and amendments to those reports, if any, or other filings filed or furnished pursuant to Section 13(a) or 15(d) of the Exchange Act as soon as reasonably practicable after electronically filing or furnishing these reports with the Securities and Exchange Commission, or SEC. Information contained on our website is not a part of this Report. We have adopted a code of ethics applicable to our employees including our principal executive, financial and accounting officers, and it is available free of charge, on our website’s investor relations page. The SEC maintains an Internet site at http://www.sec.gov that contains our Annual Report on Form 10-K, quarterly reports on Form 10-Q, current reports on Form 8-K and amendments to those reports, if any, or other filings filed or furnished pursuant to Section 13(a) or 15(d) of the Exchange Act, and our proxy and information statements. The following are certain risk factors that could affect our business, financial results and results of operations. These risk factors should be considered in connection with evaluating the forward-looking statements contained in this Report because these factors could cause the actual results and conditions to differ materially from those projected in the forward-looking statements. Before you invest in our Company, you should know that making such an investment involves some risks, including the risks described below. The risks that have been highlighted here are not the only ones that we face. If any of the risks actually occur, our business, financial condition and results of operations could be negatively affected. In that case, the trading price of our common stock could decline, and you may lose all or part of your investment. We anticipate that our revenue and operating results will fluctuate, which could adversely affect the enterprise value of our Company and our securities. the expansion of our design and integration solutions sales and operations, globally. Although we attempt to control our expense levels, these levels are based, in part, on anticipated revenue. Therefore, we may not be able to control spending in a timely manner to compensate for any unexpected revenue shortfall. Our operating results in the Technology Solutions segment also are affected by the seasonality of the IT and CE products and services industry. We have historically experienced higher sales in our fourth fiscal quarter due to patterns in the capital budgeting, federal government spending and purchasing cycles of end-users. Revenue in our Concentrix segment is typically higher in our fourth quarter due to seasonal patterns in our clients’ business. These patterns may not be repeated in subsequent periods. You should not rely on period-to-period comparisons of our operating results as an indication of future performance. In future years, our operating results may be below our expectations or those of our public market analysts or investors, which would likely cause our share price to decline. We are subject to uncertainties and variability in demand by our customers, which could decrease revenue and adversely affect our operating results, and we have customer contracts with provisions that could cause fluctuations in our revenue. In our Technology Solutions segment, we sell to our customers on a purchase order basis, rather than pursuant to long-term contracts or contracts with minimum purchase requirements. Consequently, our sales are subject to demand variability by our customers. The level and timing of orders placed by our customers vary for a variety of reasons, including seasonal buying by end-users, the introduction of new hardware and software technologies and general economic conditions. Customers submitting a purchase order may cancel, reduce or delay their orders. If we are unable to anticipate and respond to the demands of our reseller, retail and design and integration solutions customers, we may lose customers because we have an inadequate supply of products, or we may have excess inventory, either of which could harm our business, financial position and operating results. With regard to our design and integration solutions customers, unique parts are purchased based both on customer purchase orders and forecasted demand. We have limited protection against excess inventory should anticipated demand not materialize. In our Concentrix segment, we provide global business services to our customers under contracts with provisions that, if triggered, could impact our profitability. For example, many of our contracts may be terminated with a short amount of notice, and to the extent our customers terminate these contracts, we could experience unexpected fluctuations in our revenue and operating results from period to period. Additionally, some contracts have performance-related bonus or penalty provisions, whereby we could receive a bonus if we satisfy certain performance levels or have to pay a penalty for failing to do so. Whether we receive a bonus or are required to pay a penalty is unpredictable, and may cause additional fluctuations in our financial results. In addition, our customers may not guarantee a minimum volume; however, we hire employees based on anticipated average volumes. If we fail to anticipate volumes correctly, our operations and financial results may suffer. The reduction of volume, loss of customers, payment of penalties or inability to terminate any unprofitable contracts could have an adverse impact on our operations and financial results. In our Technology Solutions segment, we depend on a limited number of OEMs to supply the IT and CE products and services that we sell and the loss of, or a material change in, our business relationship with a major OEM supplier could adversely affect our business, financial position and operating results. Our future success is highly dependent on our relationships with a small number of OEM suppliers. For example, sales of HP products and services comprised approximately 12%, 13% and 17% of our consolidated revenue for fiscal years 2018, 2017 and 2016, respectively. Our OEM supplier agreements typically are short-term and may be terminated without cause upon short notice. The loss or deterioration of our relationship with HP or any other major OEM supplier, the authorization by OEM suppliers of additional distributors, the sale of products by OEM suppliers directly to our reseller and retail customers and end-users, or our failure to establish relationships with new OEM suppliers or to expand the distribution and supply chain services that we provide OEM suppliers could adversely affect our business, financial position and operating results. In addition, OEM suppliers may face liquidity or solvency issues that in turn could negatively affect our business and operating results. Our business is also highly dependent on the terms provided by our OEM suppliers. Generally, each OEM supplier has the ability to change the terms and conditions of its distribution agreements, such as reducing the amount of price protection and return rights or reducing the level of purchase discounts, incentive rebates and marketing programs available to us. From time to time we may conduct business with a supplier without a formal agreement because the agreement has expired or was otherwise terminated. In such case, we are subject to additional risk with respect to products, warranties and returns, and other terms and conditions. If we are unable to pass the impact of these changes through to our reseller and retail customers, our business, financial position and operating results could be adversely affected. In our Technology Solutions segment our gross margins are low, which magnifies the impact of variations in gross margin, operating costs and our operating results. As a result of significant price competition in the IT and CE products and services industry, our gross margins are low, and we expect them to continue to be low in the future. Increased competition arising from industry consolidation and low demand for certain IT and CE products and services may hinder our ability to maintain or improve our gross margins. These low gross margins magnify the impact of variations in revenue, operating costs and our operating results. A portion of our operating expense is relatively fixed, and planned expenditures are based in part on anticipated orders that are forecasted with limited visibility of future demand. As a result, we may not be able to reduce our operating expense to sufficiently mitigate any further reductions in gross profit or margin in the future. If we cannot proportionately decrease our cost structure in response to competitive price pressures, our business and operating results could suffer. We also receive purchase discounts and rebates from OEM suppliers based on various factors, including sales or purchase volume and breadth of customers. A decrease in net sales could negatively affect the level of volume rebates received from our OEM suppliers and thus, our gross margin. Because some rebates from OEM suppliers are based on percentage increases in sales of products, it may become more difficult for us to achieve the percentage growth in sales required for larger discounts due to the current size of our revenue base. A decrease or elimination of purchase discounts and rebates from our OEM suppliers would adversely affect our business and operating results. We are subject to the risk that our inventory value may decline, and protective terms under our OEM supplier agreements may not adequately cover the decline in value, which in turn may harm our business, financial position and operating results. The IT and CE products industry is subject to rapid technological change, new and enhanced product specification requirements, and evolving industry standards. These changes may cause inventory on hand to decline substantially in value or to rapidly become obsolete. Most of our OEM suppliers offer limited protection from the loss in value of inventory. For example, we can receive a credit from many OEM suppliers for products held in inventory in the event of a supplier price reduction. In addition, we have a limited right to return a certain percentage of purchases to most OEM suppliers. These policies are often subject to time restrictions and do not protect us in all cases from declines in inventory value. In addition, our OEM suppliers may become unable or unwilling to fulfill their protection obligations to us. The decrease or elimination of price protection, or the inability of our OEM suppliers to fulfill their protection obligations, could lower our gross margins and cause us to record inventory write-downs. If we are unable to manage our inventory with our OEM suppliers with a high degree of precision, we may have insufficient product supplies or we may have excess inventory, resulting in inventory write-downs, either of which could harm our business, financial position and operating results. We depend on OEM suppliers to maintain an adequate supply of products to fulfill customer orders on a timely basis, and any supply shortages or delays could cause us to be unable to timely fulfill orders, which in turn could harm our business, financial position and operating results. Our ability to obtain particular products in the required quantities and to fulfill reseller and retail customer orders on a timely basis is critical to our success. In most cases, we have no guaranteed price or delivery agreements with our OEM suppliers. We occasionally experience a supply shortage of certain products as a result of strong demand or problems experienced by our OEM suppliers. If shortages or delays persist, the price of those products may increase, or the products may not be available at all. Such delays could also impact our ability to procure critical components required to complete customer orders. In addition, our OEM suppliers may decide to distribute, or to substantially increase their existing distribution business, through other distributors, their own dealer networks, or directly to resellers, retailers or end-users. Accordingly, if we are not able to secure and maintain an adequate supply of products to fulfill our customer orders on a timely basis, our business, financial position and operating results could be adversely affected. Our delivery center activities in our Concentrix business are significantly concentrated in India and the Philippines, which may expose us to operational risks. Operations in our Concentrix segment are based on a global delivery model with client services provided from delivery centers located in several countries with a significant percentage of our workforce located in India and the Philippines. Socio-economic situations which are specific to these countries can severely disrupt our operations and impact our ability to fulfill our contractual obligations to our clients. If these regions experience severe natural calamities or political unrest, our personnel resources may be affected, our IT and communication infrastructure may be at risk and the client processes that we manage may be adversely affected. Changes in governments, laws, regulations, minimum wages, and taxation rules may severely impact our ability to do business in these countries, our business practices, our operating costs and our results of operations. Both our Technology Solutions and Concentrix segments have customer concentration and intense competition which could adversely impact our revenue. Our business experiences customer concentration from time to time. For example, in 2018, one customer accounted for 17% of our revenue. While we do not believe that the loss of any single customer would have a material adverse effect on the Company and its subsidiaries taken as a whole, such loss could result in an adverse impact on certain of our businesses. For example, the systems design and integration solutions business of our Technology Solutions segment has significant customer concentration, requires investments in working capital and infrastructure, and has customer contracts that often offer limited or no volume guarantees or protection for end-of-life investments. The loss of a customer or reduction in order volumes could adversely impact our revenue, provision for inventory losses, the absorption of fixed overhead costs and our future expansion plans. The system design and integration solutions business operates in a competitive environment. Volumes can fluctuate based on customer demand, delivery quality and the competitive landscape. Our ability to deliver customized solutions on a timely basis is critical to our success. Any delay could impact our competitive position and result in loss of customer orders, which could impact our financial position and operating results. In our Concentrix segment, we have experienced customer concentration. This customer concentration increases the risk of quarterly fluctuations in our operating results, depending on the seasonal pattern of our top customers’ business. In addition, our top customers could make greater demands on us with regard to pricing and contractual terms in general. The loss of, or significant decrease in demand from, any of our top customers could affect our business, results of operations and financial condition of the segment. The market for CE products that we distribute is characterized by short product life cycles. Increased competition for limited retailer shelf space, decreased promotional support from resellers or retailers or increased popularity of downloadable or online content and services could adversely impact our revenue. The market for CE products, such as personal computers and tablets, mobile devices, wearable devices, video game titles and hardware, and audio or visual equipment, is characterized by short product life cycles and frequent introductions of new products. The markets in which we compete frequently introduce new products to meet changing consumer preferences and trends. As a result, competition is intense for resellers’ and retailers’ limited shelf space and promotions. If our vendors’ new products are not introduced in a timely manner or do not achieve significant market acceptance, we may not generate sufficient sales or profitability. Further, if we are unable to successfully compete for resellers’ or retailers’ space and promotional resources, this could negatively impact market acceptance of our products and negatively impact our business and operating results. Our Concentrix business is subject to dynamic changes in its business model and intense competition, which in turn could cause our operations to suffer. The customer engagement services industry is highly competitive, highly fragmented and subject to rapid change. We believe that the principal competitive factors in this market are breadth and depth of process and domain expertise, service quality, the ability to attract, train and retain qualified people, compliance rigor, global delivery capabilities, price and marketing and sales capabilities. We compete for business with a variety of companies, including in-house captives of potential clients. If our customers place more focus in this area and internalize these operations, this could also cause a significant reduction in the size of the available market for third party service providers like us. Similarly, if competitors offer their services at lower margins to gain market share, this could cause a significant decrease in the available market for us. In addition, our success may depend on our ability to continue to develop and implement services and solutions that anticipate and respond to rapid and continuing changes in technology and offerings to serve the evolving needs of our clients. Some of these technologies, such as cloud-based services, artificial intelligence and automation, may cause an adverse shift in the way our existing business operations are conducted or decrease the size of the available market. If we are unable to hire and retain employees with domain expertise for our Concentrix business, our operations will be disrupted, and such disruption may impact our ability to manage our costs, which in turn could impact our profitability. The success of our operations and the quality of our services are highly dependent on our ability to attract and retain skilled personnel in all of our international delivery centers. The industry is characterized by high employee attrition rates and we face competition in hiring, retaining and motivating talented and skilled leaders and employees with domain experience. In addition, our profitability is directly affected by the utilization rate of our personnel resources. If we are unable to achieve optimum utilization of our personnel resources, we may experience erosions in our profit margin. However, if our utilization is too high, it may result in a deterioration in the quality of services provided to our clients and may also result in higher attrition rates. If we are unable to manage our employee attrition rates, adequately motivate our employees or utilize our personnel resources efficiently, our operations will be disrupted, and such disruption may impact our ability to manage our costs, which in turn could impact our profitability. If we fail to maintain effective internal controls over operations we perform for our clients in our Concentrix business or if our information systems are breached or client data are compromised, client relations may suffer, which in turn may adversely affect our revenue and results of operations. Our customer engagement services business involves us representing our clients in certain critical operations of their business processes such as sales, marketing and customer support. If our clients experience disruptions in these operations or are dissatisfied with the quality of service provided, our client relationships may suffer and we may face possible legal action. In addition, in management of our clients’ operations, we manage large volumes of customer information and confidential data. We may be liable and our operations may be disrupted if there is a breach of confidentiality of client data, if an employee violates policies and regulations governing the management of personal information, if we lose our client’s data or if the security of our IT systems is compromised. We may also be liable if we do not maintain adequate internal controls over the processes we manage for our clients or if we fail to comply with the laws and regulations applicable to the operations in which we represent our clients. Our clients may request us to obtain audit reports over our internal controls. If we are unable to complete these audit reports in a timely manner, or if internal control deficiencies are identified in the audit process, our client relationships may suffer. If we are unable to successfully manage our delivery centers in the Concentrix business, our results of operations could be adversely affected. Our Concentrix business, which has extensive international operations, may be adversely impacted if we are unable to manage and communicate with the resources located internationally. Service quality may be placed at risk and our ability to optimize our resources may be compromised if we are unable to manage our resources remotely. Our Concentrix business uses a wide variety of technologies to allow us to manage a large volume of work. These technologies are designed to keep our employees productive. Any failure in technology may have a negative impact on our operations. The success of our services primarily depends on the performance of our employees and resulting customer satisfaction. Any increase in average waiting time or handling time or lack of promptness or technical expertise of our employees will directly impact customer satisfaction. Any adverse customer satisfaction may impact the overall business. If we are unable to successfully manage our delivery centers, our results of operations could be adversely affected. Changes in foreign currency exchange rates and limitations on the convertibility of foreign currencies could adversely affect our business and operating results. Approximately 28% of our revenue in fiscal year 2018 and 27% for fiscal years 2017 and 2016 were generated outside the United States. Most of our international revenue, cost of revenue and operating expenses are denominated in foreign currencies. Westcon-Comstor Latin America revenue is generally denominated in local currencies while cost of revenue is denominated in U.S. dollars. We presently have currency exposure arising from both sales and purchases denominated in foreign currencies. Changes in exchange rates between foreign currencies and the U.S. dollar may adversely affect our operating margins. For example, if these foreign currencies appreciate against the U.S. dollar, it will be more expensive in terms of U.S. dollars to purchase inventory or pay expenses with foreign currencies. This could have a negative impact on us if revenue related to these purchases is transacted in U.S. dollars. In addition, currency devaluation can result in our products, the majority of which are purchased by us in U.S. dollars, to be relatively more expensive to procure than products manufactured locally. In our Technology Solutions segment, we currently conduct only limited hedging activities, which involve the use of currency forward contracts. Hedging foreign currencies can be risky. Certain of these hedge positions are undesignated hedges of balance sheet exposures, such as intercompany loans, and typically have maturities of less than one year. In our Concentrix segment, our customer engagement services are delivered from several delivery centers located around the world, with significant operations in the Philippines and India. As a result, our revenue may be earned in currencies that are different from the currencies in which we incur corresponding expenses. Fluctuations in the value of currencies, such as the Philippine Peso, the Indian Rupee, and the Brazilian Real against the U.S. Dollar, and inflation in the local economies in which these delivery centers are located, could increase the operating and labor costs in these delivery centers which can result in reduced profitability. Although we enter into hedging contracts in certain currencies to limit our potential foreign currency exposure, a significant decrease in the value of the contractual currency, relative to the currencies where services are provided, could have a material adverse impact on our operating results that are not fully offset by gains realized under our hedging contracts. There is also additional risk if the currency is not freely or actively traded. Some currencies, such as the Chinese Renminbi, the Philippines Peso and the Indian Rupee, are subject to limitations on conversion into other currencies, which can limit our ability to hedge or to otherwise react to rapid foreign currency devaluations. We cannot predict the impact of future exchange rate fluctuations on our business and operating results. We do not use derivative financial instruments for speculative trading purposes, nor do we hedge our foreign currency exposure in a manner that entirely offsets the effects of changes in foreign exchange rates. As a general rule, we do not use financial instruments to hedge local currency denominated operating expenses in countries where a natural hedge exists. For example, in many countries, revenue from the local currency services substantially offsets the local currency denominated operating expenses. Because we conduct substantial operations in China, risks associated with economic, political and social events in China could negatively affect our business and operating results. uncertainties related to continued economic and social reform. Our IT systems are an important part of our global operations. Any significant interruption in service, whether resulting from any of the above uncertainties, natural disasters or otherwise, could result in delays in our inventory purchasing, errors in order fulfillment, reduced levels of customer service and other disruptions in operations, any of which could cause our business and operating results to suffer. We may have higher than anticipated tax liabilities. uncertainty in obtaining tax holiday extensions or expiration or loss of tax holidays in various jurisdictions. We report our results of operations based on our determination of the amount of taxes owed in various tax jurisdictions in which we operate. The determination of our worldwide provision for income taxes and other tax liabilities requires estimation, judgment and calculations where the ultimate tax determination may not be certain. Our determination of tax liability is always subject to review or examination by tax authorities in various tax jurisdictions. Any adverse outcome of such review or examination could have a negative impact on our operating results and financial condition. The results from various tax examinations and audits may differ from the liabilities recorded in our financial statements and could adversely affect our financial results and cash flows. We have pursued and intend to continue to pursue strategic acquisitions or investments in new markets and may encounter risks associated with these activities, which could harm our business and operating results. our due diligence process may fail to identify significant issues with the acquired company’s product and service quality, financial disclosures, accounting practices or internal control deficiencies. We may incur additional costs and certain redundant expenses in connection with our acquisitions and investments, which may have an adverse impact on our operating margins. Future acquisitions may result in dilutive issuances of equity securities, the incurrence of additional debt, large write-offs, a decrease in future profitability, or future losses. The incurrence of debt in connection with any future acquisitions could restrict our ability to obtain working capital or other financing necessary to operate our business. Our recent and future acquisitions or investments may not be successful, and if we fail to realize the anticipated benefits of these acquisitions or investments, our business and operating results could be harmed. We may fail to realize the anticipated benefits and cost savings of the Convergys acquisition, which could adversely affect the value of shares of our common stock. the assumption of known and unknown liabilities of Convergys. If we are not able to successfully combine the business of Convergys within the anticipated time frame, or at all, the anticipated cost savings and other benefits of the acquisition may not be realized fully or at all or may take longer to realize than expected, the combined businesses may not perform as expected and the value of the shares of our common stock may be adversely affected. consolidating offices of SYNNEX and Convergys that are currently in or near the same location. SYNNEX’ and Convergys’ business relationships may be subject to disruption due to uncertainty associated with the acquisition. Parties with which SYNNEX or Convergys do business may experience uncertainty associated with the acquisition, including with respect to current or future business relationships with us, Convergys or the combined business. SYNNEX’ and Convergys’ business relationships may be subject to disruption as customers, vendors and others may attempt to negotiate changes in existing business relationships or consider entering into business relationships with parties other than SYNNEX, Convergys or the combined business. These disruptions could have a material and adverse effect on the businesses, financial condition, results of operations or prospects of the combined business, including a material and adverse effect on our ability to realize the anticipated benefits of the acquisition. We have incurred significant transaction and integration-related costs in connection with the Convergys acquisition, and such costs could adversely affect our ability to execute on our integration plan. We have incurred a number of non-recurring costs associated with the acquisition and combining the operations of Convergys with our operations. We will also incur significant integration-related fees and costs related to formulating and implementing integration plans, including facilities and systems consolidation costs and employment-related costs. Although we expect that the elimination of duplicative costs, as well as the realization of other efficiencies related to the integration of the businesses, should allow us to offset integration-related costs over time, this net benefit may not be achieved in the near term, or at all. Lawsuits have been filed and other lawsuits may be filed against SYNNEX, Convergys, their affiliates and their boards of directors and executive officers challenging the merger. An adverse ruling in any such lawsuit may result in additional payments and costs. On September 10, 2018, two lawsuits were brought by and/or on behalf of Convergys shareholders against Convergys and its board of directors. One of the lawsuits also named as defendants SYNNEX and two of its affiliates. The first action, a putative class action and derivative lawsuit (captioned Franchi v. Ayers, et al., Case No. A 1804876) (the “Franchi Action”), was filed in the Ohio Court of Common Pleas, Hamilton County (the “Ohio Court”) against Convergys, individual members of Convergys’ board of directors, SYNNEX, Merger Sub I and Merger Sub II, alleging breach of fiduciary duty in connection with the Merger. On September 25, 2018, the lawyers for plaintiff in the Franchi Action stated that the additional disclosures made by Convergys are sufficient to moot plaintiff’s claims. On November 6, 2018, plaintiff moved to voluntarily dismiss the Franchi Action on that ground. On December 4, 2018, the court signed an order (entered December 10, 2018) granting the motion and dismissing the action. Counsel for plaintiff have indicated that they will ask the court to award them a mootness fee, on the theory that Franchi’s lawsuit led to the additional disclosures, if they are unable to reach agreement with defendants on such a fee. Negotiations are ongoing. The second action, a putative class action lawsuit (captioned Zalvin v. Ayers, et al., Case No. A 1804888) (the “Zalvin Action” and, together with the Franchi Action, the “Actions”), was filed in the Ohio Court against Convergys and individual members of Convergys’ board of directors, alleging breach of fiduciary duty in connection with the Merger. The Zalvin Action seeks, among other things, orders (i) declaring that the Merger was agreed to in breach of the defendants’ fiduciary duties or that the defendants aided and abetted such breaches, (ii) declaring that the defendants breached their duty of a full and fair disclosure, (iii) enjoining the defendants from proceeding with or consummating the Merger until the requested disclosures are made, (iv) awarding plaintiffs compensatory damages, and (v) awarding plaintiff’s costs and attorneys’ and expert fees. On September 25, 2018, plaintiff filed an amended complaint, adding derivative claims to his original class claims. On September 26, 2018, the Ohio Court denied the preliminary injunction motion and a written order denying the motion was entered on September 28, 2018. Plaintiff filed a second amended complaint on November 16, 2018 adding allegations about the motivations of Convergys’ CEO and Convergys’ board of directors and updating the previous allegations to reflect the closing of the merger. Defendants responded to that complaint by filing a motion to dismiss on December 31, 2018. We believe that the Actions are without merit, and plan to vigorously defend against these claims. However, any adverse ruling in these cases could result in additional payments. Additional lawsuits arising out of or relating to the merger agreement and/or the merger may be filed in the future. Even if the lawsuits are without merit, defending against these claims can result in substantial costs and divert management time and resources. An adverse judgment could result in monetary damages, which could have a negative impact on our liquidity and financial condition. Our goodwill and identifiable intangible assets could become impaired, which could have a material non-cash adverse effect on our results of operations. We recorded substantial goodwill and amortizable intangible assets as a result of our previous acquisitions. We review our goodwill and intangible assets for impairment when events or changes in circumstances indicate the carrying value may not be recoverable. We assess whether there has been an impairment in the value of goodwill at least annually. Factors that may be considered a change in circumstances indicating that the carrying value of our goodwill or intangible assets may not be recoverable include declines in stock price, market capitalization or cash flows and slower growth rates in our industry. We could be required to record a significant charge to earnings in our financial statements during the period in which any impairment of our goodwill or intangible assets were determined, negatively impacting our results of operations. Because of the capital-intensive nature of our Technology Solutions business, we need continued access to capital, which if not available to us or if not available on favorable terms, could harm our ability to operate or expand our business. Our Technology Solutions business requires significant levels of capital to finance accounts receivable and product inventory that is not financed by trade creditors. If cash from available sources is insufficient, proceeds from our accounts receivable securitization and revolving credit programs are limited or cash is used for unanticipated needs, we may require additional capital sooner than anticipated. In the event we are required, or elect, to raise additional funds, we may be unable to do so on favorable terms, or at all, and may incur expenses in raising the additional funds. Our current and future indebtedness could adversely affect our operating results and severely limit our ability to plan for, or react to, changes in our business or industry. We could also be limited by financial and other restrictive covenants in securitization or credit arrangements, including limitations on our borrowing of additional funds and issuing dividends. Furthermore, the cost of securitization or debt financing could significantly increase in the future, making it cost prohibitive to securitize our accounts receivable or borrow, which could force us to issue new equity securities. If we issue new equity securities, existing stockholders may experience dilution, or the new equity securities may have rights, preferences or privileges senior to those of existing holders of common stock. If we cannot raise funds on acceptable terms, we may not be able to take advantage of future opportunities or respond to competitive pressures or unanticipated requirements. Any inability to raise additional capital when required could have an adverse effect on our business and operating results. The terms of our debt arrangements impose significant restrictions on our ability to operate which in turn could negatively affect our ability to respond to business and market conditions and therefore could have an adverse effect on our business and operating results. merge, consolidate or sell, assign, transfer, lease, convey or otherwise dispose of all or substantially all of our assets. We are also required to maintain specified financial ratios and satisfy certain financial condition tests under certain of our debt facilities. Our inability to meet these ratios and tests could result in the acceleration of the repayment of the related debt, termination of the applicable facility, an increase in our effective cost of funds or the cross-default of other credit and securitization arrangements. As a result, our ability to operate may be restricted and our ability to respond to business and market conditions may be limited, which could have an adverse effect on our business and operating results. We may not be able to generate sufficient cash to service all of our indebtedness and may be forced to take other actions to satisfy our obligations, which could adversely affect our business. Our ability to make scheduled debt payments or to refinance our debt obligations depends on our financial and operating performance, which is subject to prevailing economic and competitive conditions and to certain financial, business and other factors beyond our control. We cannot be certain that we will maintain a level of cash flows from operating activities sufficient to permit us to pay the principal and interest on our indebtedness. If our cash flows and capital resources are insufficient to fund our debt service obligations, we may be forced to reduce or delay capital expenditures, sell assets or operations, seek additional capital or restructure or refinance our indebtedness. We cannot be certain that we would be able to take any of these actions, that these actions would be successful and permit us to meet our scheduled debt service obligations or that these actions would be permitted under the terms of our existing or future debt agreements. In the absence of such operating results and resources, we could face substantial liquidity problems and might be required to dispose of material assets or operations to meet our debt service and other obligations. Some of our credit facilities restrict our ability to dispose assets and use the proceeds from such disposition. As such, we may not be able to consummate those dispositions or use any resulting proceeds and, in addition, such proceeds may not be adequate to meet any debt service obligations then due. we could be forced into bankruptcy or liquidation, which is likely to result in delays in the payment of our indebtedness and in the exercise of enforcement remedies related to our indebtedness. If the interest rates on our borrowings increase, our access to capital and net income could be adversely affected. Our borrowings and securitization arrangements are variable-rate obligations and expose us to interest rate risks. If interest rates increase, debt service obligations and our interest expense will increase even though the amount borrowed remains the same. Our net income and cash flows, including cash available for servicing indebtedness, will correspondingly decrease. An increase in interest rates may increase our future borrowing costs and restrict our access to capital. Additionally, current market conditions, the recovering global economy, and overall credit conditions could limit our availability of capital, which could cause increases in interest margin spreads over underlying indices, effectively increasing the cost of our borrowing. While some of our credit facilities have contractually negotiated spreads, any changes to these spreads in connection with renegotiations of our credit facilities could adversely affect our results of operations. We have entered into interest rate swaps with financial institutions to effectively convert a portion of our floating rate debt to a fixed interest rate to manage our exposure to fluctuations in interest rates. In the event of the nonperformance by the counterparties, we are exposed to credit losses. A portion of our revenue is financed by floor plan financing companies and any termination or reduction in these financing arrangements could increase our financing costs and harm our business and operating results. A portion of our product distribution revenue is financed by floor plan financing companies. Floor plan financing companies are engaged by our customers to finance, or floor, the purchase of products from us. In exchange for a fee, we transfer the risk of loss on the sale of our products to the floor plan companies. We currently receive payment from these financing companies within approximately 15 to 30 days from the date of the sale, which allows our business to operate at much lower relative working capital levels than if such programs were not available. If these floor plan arrangements are terminated or substantially reduced, the need for more working capital and the increased financing cost could harm our business and operating results. We have significant credit exposure to our customers, and negative trends in their businesses could cause us significant credit loss and negatively impact our cash flow and liquidity position. our accounts receivable securitization program. These circumstances could negatively impact our cash flow and liquidity position, or result in the cross-default to our other indebtedness and acceleration of the repayment of our indebtedness. Further, we are exposed to higher collection risk as we continue to expand internationally, where the payment cycles are generally longer and the credit rating process may not be as robust as in the United States, and where our access to accounts receivable financing is more limited. We are dependent on a variety of IT and telecommunications systems and the Internet, and any failure of these systems could adversely impact our business and operating results. We depend on IT and telecommunications systems and the Internet for our operations. These systems support a variety of functions including inventory management, order processing, shipping, shipment tracking, billing, and our Concentrix business. Failures or significant downtime of our IT or telecommunications systems could prevent us from taking customer orders, printing product pick-lists, shipping products, billing customers and handling call volume. Frequent or prolonged interruption in our ability to provide service in our Concentrix business would adversely affect our client relationships and damage our reputation. Sales also may be affected if our reseller and retail customers are unable to access our pricing and product availability information. We also rely on the Internet, and in particular EDI and XML, for a large portion of our orders and information exchanges with our OEM suppliers and reseller and retail customers. The Internet and individual websites have experienced a number of disruptions and slowdowns, some of which were caused by organized attacks. In addition, some websites have experienced security breakdowns. If we were to experience a security breakdown, disruption or breach that compromised sensitive information, it could harm our relationship with our OEM suppliers and reseller and retail customers. Disruption of our website or the Internet in general could impair our order processing or more generally prevent our OEM suppliers and reseller and retail customers from accessing information. Our Concentrix business is dependent upon telephone and data services provided by third party telecommunications service vendors and our IT and telecommunications systems. Any significant increase in our IT and telecommunications costs or temporary or permanent loss of our IT or telecommunications systems could harm our relationships with our customers. The occurrence of any of these events could have an adverse effect on our operations and financial results. Cyberattacks or the improper disclosure or control of personal information could result in liability and harm our reputation, which could adversely affect our business. Our business is heavily dependent upon information technology networks and systems. Internal or external attacks on those networks and systems could disrupt our normal operations centers and impede our ability to provide critical products and services to our customers and clients, subjecting us to liability under our contracts and damaging our reputation. Our business also involves the use, storage and transmission of information about our employees, our clients and customers of our clients. If any person, including any of our employees, negligently disregards or intentionally breaches our established controls with respect to such data or otherwise mismanages or misappropriates that data, we could be subject to monetary damages, fines or criminal prosecution. Unauthorized disclosure of sensitive or confidential client or customer data, whether through system failure, employee negligence, fraud or misappropriation, along with unauthorized access to or through our information systems or those we develop for clients, whether by our employees or third parties, could result in negative publicity, loss of clients, legal liability and damage to our reputation, business, results of operations and financial condition. While we take measures to protect the security of, and prevent unauthorized access to, our systems and personal and proprietary information, the security controls for our systems, as well as other security practices we follow, may not prevent improper access to, or disclosure of, personally identifiable or proprietary information. Furthermore, data privacy is subject to frequently changing rules and regulations, which sometimes conflict among the various jurisdictions and countries in which we provide services. The General Data Protection Regulation (GDPR) in Europe and the Data Privacy Act in Philippines have resulted, and will continue to result, in increased compliance costs. Our failure to adhere to or successfully implement processes in response to these and other changing regulatory requirements in this area could result in legal liability or impairment to our reputation in the marketplace, which could have a material adverse effect on our business, financial condition and results of operations. We rely on independent shipping companies for delivery of products, and price increases or service interruptions from these carriers could adversely affect our business and operating results. We rely almost entirely on arrangements with independent shipping companies, such as FedEx and UPS, for the delivery of our products from OEM suppliers and delivery of products to reseller and retail customers. Freight and shipping charges can have a significant impact on our gross margin. As a result, an increase in freight surcharges due to rising fuel cost or general price increases will have an immediate adverse effect on our margins, unless we are able to pass the increased charges to our reseller and retail customers or renegotiate terms with our OEM suppliers. In addition, in the past, carriers have experienced work stoppages due to labor negotiations with management. An increase in freight or shipping charges, the termination of our arrangements with one or more of these independent shipping companies, the failure or inability of one or more of these independent shipping companies to deliver products, or the unavailability of their shipping services, even temporarily, could have an adverse effect on our business and operating results. Because of the experience of our key personnel in the IT, CE and the customer engagement services industries and their technological and industry expertise, if we were to lose any of our key personnel, it could inhibit our ability to operate and grow our business successfully. We are dependent in large part on our ability to retain the services of our key senior executives and other technological and industry experts and personnel. Except for Dennis Polk, our President and Chief Executive Officer, we generally do not have employment agreements with our executives or employees. We also do not carry “key person” insurance coverage for any of our key executives. We compete for qualified senior management and technical personnel. The loss of, or inability to hire, key executives or qualified employees could inhibit our ability to operate and grow our business successfully. We may experience theft of product from our warehouses, water damage to our properties and other casualty events which could harm our operating results. From time to time, we have experienced incidents of theft at various facilities, water damages to our properties and other casualty events. These types of incidents may make it more difficult or expensive for us to obtain insurance coverage in the future. Also, the same or similar incidents may occur in the future for which we may not have sufficient insurance coverage or policy limits to be fully compensated for the loss, which may have an adverse effect on our business and financial results. We may become involved in intellectual property or other disputes that could cause us to incur substantial costs, divert the efforts of our management, and require us to pay substantial damages or require us to obtain a license, which may not be available on commercially reasonable terms, if at all. From time to time, we receive notifications alleging infringements of intellectual property rights allegedly held by others relating to our business or the products we sell or integrate for our OEM suppliers and others. Litigation with respect to patents or other intellectual property matters could result in substantial costs and diversion of management and other resources and could have an adverse effect on our business. Although we generally have various levels of indemnification protection from our OEM suppliers and design and integration solutions customers, in many cases any indemnification to which we may be entitled is subject to maximum limits or other restrictions. In addition, we have developed proprietary IT systems, mobile applications, and cloud-based technology and acquired technologies that play an important role in our business. If any infringement claim is successful against us and if indemnification is not available or sufficient, we may be required to pay substantial damages or we may need to seek and obtain a license of the other party’s intellectual property rights. We may be unable to obtain such a license on commercially reasonable terms, if at all. We are from time to time involved in other litigation in the ordinary course of business. We may not be successful in defending these or other claims. Regardless of the outcome, litigation could result in substantial expense and could divert the efforts of our management. We have significant operations concentrated in North and Latin America, Asia-Pacific and Europe and any disruption in the operations of our facilities could harm our business and operating results. Our worldwide operations could be subject to natural disasters, adverse weather conditions and other business disruptions, which could seriously harm our revenue and financial condition and increase our costs and expenses. We have significant operations in our facilities located in North and Latin America, Asia-Pacific and Europe. As a result, any prolonged disruption in the operations of our facilities, whether due to technical difficulties, power failures, break-ins, destruction or damage to the facilities as a result of a natural disaster, fire or any other reason, could harm our operating results. If there are related disruptions in local or international supply chains, we may experience supply shortages or delays in receiving products from our OEM suppliers or experience other delays in shipping to our customers. If we are unable to fulfill customer requirements in a timely manner, this could harm our operating results. For example, our Philippines operation is at greater risk due to adverse weather conditions, such as typhoons, mudslides and floods. We currently have a disaster recovery plan and business interruption insurance; however, they may not be sufficient to compensate for losses that may occur. Global health and economic, political and social conditions may harm our ability to do business, increase our costs and negatively affect our stock price. may enhance volatility in currency exchange rates, cause our customers or potential customers to delay or reduce spending on our products or services, and limit our suppliers’ access to credit. It could also adversely impact our ability to obtain adequate insurance at reasonable rates and may require us to incur increased costs for security measures for our domestic and international operations. We are predominantly uninsured for losses and interruptions caused by terrorism, acts of war and similar events. These uncertainties make it difficult for us and our suppliers and customers to accurately plan future business activities. Part of our business is conducted outside of the United States, exposing us to additional risks that may not exist in the United States, which in turn could cause our business and operating results to suffer. seasonal reductions in business activity in some parts of the world. We may continue to expand internationally to respond to competitive pressure and customer and market requirements. Establishing operations in any foreign country or region presents risks such as those described above as well as risks specific to the particular country or region. In addition, until a payment history is established over time with customers in a new geography or region, the likelihood of collecting accounts receivable generated by such operations could be less than our expectations. As a result, there is a greater risk that reserves set with respect to the collection of such accounts receivable may be inadequate. Furthermore, if our international expansion efforts in any foreign country are unsuccessful, we may decide to cease operations, which would likely cause us to incur additional expense and loss. In addition, changes in policies or laws of the United States or foreign governments resulting in, among other things, higher taxation, currency conversion limitations, restrictions on fund transfers or the expropriation of private enterprises, could reduce the anticipated benefits of our international expansion. Any actions by countries in which we conduct business to reverse policies that encourage foreign trade or investment could adversely affect our business. If we fail to realize the anticipated growth of our future international operations, our business and operating results could suffer. The concentration of ownership of our common stock among our executive officers, directors and principal stockholders could allow them to influence all matters requiring stockholder approval and could delay or prevent a change in control of SYNNEX. As of November 30, 2018, our executive officers, directors and principal stockholders owned approximately 20% of our outstanding common stock. In particular, MiTAC Holdings Corporation (“MiTAC Holdings”) and its affiliates owned approximately 18% of our common stock. MiTAC Holdings is a publicly-traded company on the Taiwan Stock Exchange. As a result, these stockholders have the potential ability to influence or control matters requiring stockholder approval, including the election of directors and the approval of mergers and acquisitions, or exert influence on actions of our Board of Directors. This concentration of ownership may have the effect of delaying, preventing or deterring a change of control of our company, could deprive our stockholders of an opportunity to receive a premium for their common stock as part of a sale of our company and might ultimately affect the market price of our common stock. There could be potential conflicts of interest between us and MiTAC Holdings and its affiliates, which could affect our business and operating results. MiTAC Holdings’ and its affiliates’ continuing beneficial ownership of our common stock could create conflicts of interest with respect to a variety of matters, such as potential acquisitions, competition, issuance or disposition of securities, election of directors, payment of dividends and other business matters. For example, we currently purchase inventories from MiTAC Holdings. Similar risks could exist as a result of Matthew Miau’s positions as our Chairman Emeritus, a member of our Board of Directors, the Chairman of MiTAC Holdings and as a director or officer of MiTAC Holdings’ affiliates. For fiscal year 2018, Mr. Miau received the same compensation as our independent directors and during fiscal year 2019 Mr. Miau will receive the same compensation as our independent directors. Mr. Miau’s compensation as one of our directors is based upon the approval of the Nominating and Corporate Governance Committee, which is solely composed of independent members of the Board of Directors. We also have adopted a policy requiring material transactions in which any of our directors has a potential conflict of interest to be approved by our Audit Committee, which is also composed of independent members of the Board of Directors. Synnex Technology International Corp., or Synnex Technology International, a publicly-traded company based in Taiwan and affiliated with MiTAC Holdings, currently provides distribution and fulfillment services to various markets in Asia and Australia, and is also a potential competitor of ours. As of November 30, 2018, MiTAC Incorporated, a privately-held company based in Taiwan and a separate entity from MiTAC Holdings, directly and indirectly owned approximately 14.4% of Synnex Technology International and approximately 7.8% of MiTAC Holdings. As of November 30, 2018, MiTAC Holdings directly and indirectly owned 0.2% of Synnex Technology International. In addition, MiTAC Holdings directly and indirectly owned approximately 8.7% of MiTAC Incorporated and Synnex Technology International directly and indirectly owned approximately 18.4% of MiTAC Incorporated as of November 30, 2018. Synnex Technology International indirectly through its ownership of Peer Developments Limited owned approximately 7.5% of our outstanding common stock as of November 30, 2018. Neither MiTAC Holdings, nor Synnex Technology International is restricted from competing with us. In the future, we may increasingly compete with Synnex Technology International, particularly if our business in Asia expands or Synnex Technology International expands its business into geographies or customers we serve. Although Synnex Technology International is a separate entity from us, it is possible that there will be confusion as a result of the similarity of our names. Moreover, we cannot limit or control the use of the Synnex name by Synnex Technology International in certain geographies and our use of the Synnex name may be restricted as a result of registration of the name by Synnex Technology International or the prior use in jurisdictions where it currently operates. Volatility in the IT and CE industries could have a material adverse effect on our business and operating results. We have in the past, experienced decreases in demand and we anticipate that the industries we operate in will be subject to a high degree of cyclicality in the future. Softening demand for our products and services caused by an ongoing economic downturn and over-capacity may impact our revenue, as well the salability of inventory and collection of reseller and retail customer accounts receivable. In addition, if we are not able to adequately adapt to the emergence of new technology or customer demand, such as cloud-based IT infrastructure and software-as-a-service, our future operating results could be adversely affected. We are subject to intense competition in the Technology Solutions and Concentrix businesses, both in the United States and internationally, and if we fail to compete successfully, we will be unable to gain or retain market share. We operate in a highly competitive environment, both in the United States and internationally. This competition is based primarily on product and service availability, credit availability, price, speed of delivery, ability to tailor specific solutions to customer needs, quality and depth of product and service lines, pre-sales and post-sales technical support, flexibility and timely response to design changes, and technological capabilities, service and support. We compete with a variety of regional, national and international IT and CE product and service providers and contract manufacturers and assemblers and providers of customer engagement services. In some instances, we also compete with our own customers, our own OEM suppliers and MiTAC Holdings and its affiliates. Our primary competitors are substantially larger and have greater financial, operating, manufacturing and marketing resources than us. Some of our competitors may have broader geographic breadth and range of services than us and may have more developed relationships with their existing customers. We may lose market share in the United States or in international markets, or may be forced in the future to reduce our prices in response to the actions of our competitors and thereby experience a reduction in our gross margins. In addition, in our Concentrix business, we also face competition from our customers. For example, some of our customers may have internal capabilities and resources to provide their own customer contact centers. Furthermore, pricing pressures and quality of services could impact our business adversely. Our ability to provide a high quality of service is dependent on our ability to retain and properly train our employees and to continue investing in our infrastructure, including IT and telecommunications systems. We may initiate other business activities, including the broadening of our supply chain capabilities, and may face competition from companies with more experience in those new areas. In addition, as we enter new areas of business, we may also encounter increased competition from current competitors or from new competitors, including some that may once have been our OEM suppliers or reseller and retail customers. Increased competition and negative reaction from our OEM suppliers or reseller and retail customers resulting from our expansion into new business areas could harm our business and operating results. Our business may be adversely affected by some OEM suppliers’ strategies to consolidate business or increase their direct sales, which in turn could cause our business and operating results to suffer. A determination by any of our primary OEMs to consolidate their business with other distributors or integration service providers could negatively affect our business and operating results. Consolidation of OEM suppliers has resulted in fewer sources for some of the products and services that we distribute. This consolidation has also resulted in larger OEM suppliers that have significant operating and financial resources. Other suppliers may reduce or eliminate promotional activities to reduce their expenses, which could, in turn, result in declined demand from our reseller or retailer customers and end-users. Some OEM suppliers, including some of the leading OEM suppliers that we service, have been selling products and services directly to reseller and retail customers and end-users, thereby limiting our business opportunities. If large OEM suppliers increasingly sell directly to end-users or our resellers and retailers, rather than use us as the distributor of their products and services, our business and operating results will suffer. The IT and CE industries are subject to rapidly changing technologies and process developments, and we may not be able to adequately adjust our business to these changes, which in turn would harm our business and operating results. Dynamic changes in the IT and CE industries, including the consolidation of OEM suppliers and reductions in the number of authorized distributors used by OEM suppliers, have resulted in new and increased responsibilities for management personnel and have placed, and continue to place, a significant strain upon our management, operating and financial systems and other resources. We may be unable to successfully respond to and manage our business in light of industry developments and trends. As end users migrate to cloud-based IT infrastructure and software-as-a-service, sales of hardware products may be reduced, thereby negatively impacting our operating results. Also crucial to our success in managing our operations is our ability to achieve additional economies of scale. Our failure to achieve these additional economies of scale or to respond to changes in the IT and CE industries could adversely affect our business and operating results. If we are unable to maintain effective internal control over financial reporting, our ability to report our financial results on a timely and accurate basis may be adversely affected, which in turn could cause the market price of our common stock to decline. Section 404 of the Sarbanes-Oxley Act of 2002 requires our management to report on, and our independent registered public accounting firm to attest to, the effectiveness of our internal control structure and procedures for financial reporting. We completed an evaluation of the effectiveness of our internal control over financial reporting for fiscal year 2018, and we have an ongoing program to perform the system and process evaluation and testing necessary to continue to comply with these requirements. However, internal control over financial reporting has inherent limitations, including human error, the possibility that controls could be circumvented or become inadequate because of changed conditions, and fraud. Because of the inherent limitations, misstatements due to error or fraud may occur and may not always be prevented or timely detected. We expect to continue to incur significant expense and to devote management resources to Section 404 compliance. In the event that one of our Chief Executive Officer, Chief Financial Officer or independent registered public accounting firm determines that our internal control over financial reporting is not effective as defined under Section 404, investor perceptions and our reputation may be adversely affected and the market price of our stock could decline. Changes to financial accounting standards may affect our results of operations and cause us to change our business practices. We prepare our financial statements to conform to generally accepted accounting principles in the United States. These accounting principles are subject to interpretation by the Financial Accounting Standards Board, American Institute of Certified Public Accountants, the SEC and various bodies formed to interpret and create appropriate accounting policies. A change in those policies can have a significant effect on our reported results and may affect our reporting of transactions completed before a change is announced. Changes to those rules or the questioning of current practices may adversely affect our reported financial results or the way we conduct our business. Our principal executive offices are located in Fremont, California, and are owned by us. We operate distribution, integration, contact center and administrative facilities in different countries. Our Technology Solutions segment occupies approximately 60 facilities covering approximately 5.1 million square feet and includes warehouse, logistics and administrative facilities. We own approximately 1.4 million square feet of property and lease the remainder. Our Concentrix segment occupies over 275 facilities comprising service and delivery centers and administrative facilities covering approximately 16.0 million square feet. We own approximately 1.3 million square feet and lease the remainder. We have sublet unused portions of some of our facilities. We believe our facilities are well maintained and adequate for current and near future operating needs. Upon the expiration or termination of any of our leased facilities, we believe we could obtain comparable office space. We are from time to time involved in legal proceedings in the ordinary course of business. We do not believe that these proceedings will have a material adverse effect on the results of our operations, our financial position or the cash flows of our business. In addition, we have been involved in various bankruptcy preference actions where we were a supplier to the companies now in bankruptcy. These preference actions are filed by the bankruptcy trustee on behalf of the bankrupt estate and generally seek to have payments made by the debtor within 90 days prior to the bankruptcy returned to the bankruptcy estate for allocation among all of the bankruptcy estate’s creditors. We are not currently involved in any material preference proceedings. Dennis Polk is our President and Chief Executive Officer and has served in this capacity since March 2018. Mr. Polk is also a Director and has served in this capacity since February 2012. Mr. Polk previously served as our Chief Operating Officer, Chief Financial Officer and Senior Vice President of Corporate Finance since joining us in February 2002. Mr. Polk received a Bachelor of Science degree in Accounting from Santa Clara University. Peter Larocque is President, North American Technology Solutions and has served in this capacity since November 2013, having previously served as President of U.S. Distribution since July 2006, Executive Vice President of Distribution since June 2001, and Senior Vice President of Sales and Marketing from September 1997 until June 2001. Mr. Larocque is responsible for SYNNEX’ North American Technology Solutions business. He received a Bachelor of Science degree in Economics from the University of Western Ontario, Canada. Marshall Witt is our Chief Financial Officer and has served in this capacity since April 2013. Prior to joining SYNNEX, Mr. Witt was Senior Vice President of Finance and Controller with FedEx Freight. During his fifteen year tenure with FedEx Corporation, Mr. Witt held progressive financial and operational roles. Prior to FedEx Corporation, he held accounting and finance leadership positions including five years with KPMG LLP as an audit manager for banking and transportation clients. Mr. Witt holds a Bachelor of Business Administration in Finance from Pacific Lutheran University and a Masters in Accounting from Seattle University and is a Certified Public Accountant. Christopher Caldwell is Executive Vice President and President of Concentrix Corporation and has served in this capacity since February 2014. He previously served as President of Concentrix Corporation from June 2012 to February 2014, Senior Vice President and General Manager of Concentrix Corporation from March 2007 to June 2012, and Senior Vice President, Global Business Development from March 2007 to June 2012. Mr. Caldwell joined SYNNEX in 2004 as Vice President, Emerging Business through the acquisition of EMJ Data Systems Ltd.
Simon Leung is our Senior Vice President, General Counsel and Corporate Secretary and has served in this capacity since May 2001. Mr. Leung joined SYNNEX in November 2000 as Corporate Counsel. Prior to SYNNEX, Mr. Leung was an attorney at the law firm of Paul, Hastings, Janofsky & Walker LLP. Mr. Leung received a Bachelor of Arts degree from the University of California, Davis in International Relations and his Juris Doctor degree from the University of Minnesota Law School. As of January 22, 2019, our common stock was held by 5,305 stockholders of record. Because many of the shares of our common stock are held by brokers and other institutions on behalf of stockholders, we are unable to estimate the total number of beneficial owners represented by these stockholders of record. 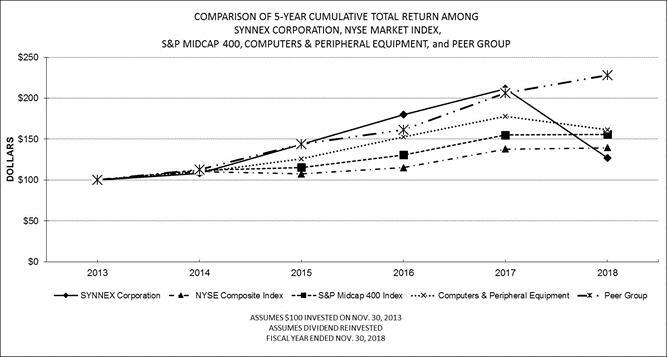 The stock price performance graph below, which assumes a $100 investment on November 30, 2013, compares our cumulative total stockholder return, the NYSE Composite Index, S&P Midcap 400 Index, Computer & Peripheral Equipment index and a peer group of our Concentrix segment for the period beginning November 30, 2013 through November 30, 2018. The Computer & Peripheral Equipment index is based on the Standard Industrial Classification Code 5045—Wholesale Computer and Computer Peripheral Equipment and Software. The companies selected to form the Concentrix peer group index include Accenture plc, Genpact Limited, Teleperformance S.A., TTEC Holdings Inc., Conduent Inc., Transcosmos Inc., Sykes Enterprises, Inc., and Globant S.A. The closing price per share of our common stock was $80.74 on November 30, 2018. The comparisons in the table are required by the SEC and are not intended to forecast or be indicative of possible future performance of our common stock. Information regarding the Securities Authorized for Issuance under Equity Compensation Plans can be found under Item 12 of this Report. On January 10, 2019, we announced a cash dividend of $0.375 per share to stockholders of record as of January 22, 2019, payable on January 31, 2019. Dividends are subject to continued capital availability, compliance with the covenants and conditions in some of our credit facilities and the declaration by our Board of Directors in the best interest of our stockholders. In June 2017, we announced that our Board of Directors authorized a three-year $300,000,000 share repurchase program pursuant to which the Company may repurchase its outstanding common stock from time to time in the open market or through privately negotiated transactions. As of November 30, 2018, we had repurchased 679,587 shares of our common stock at an average price of $97.10 per share for an aggregate purchase price of $65,987,446 since inception of the stock repurchase program, and the remaining authorized amount for stock repurchases under this program is $234,012,554 by June 2020. The following selected consolidated financial data are qualified by reference to, and should be read together with, “Management’s Discussion and Analysis of Financial Condition and Results of Operations” included in Item 7 of this Report and the Consolidated Financial Statements and related Notes included in Item 8 of this Report. The selected Consolidated Statements of Operations and other data presented below for fiscal years 2018, 2017 and 2016 and the consolidated balance sheet data as of November 30, 2018 and 2017 have been derived from our audited Consolidated Financial Statements included elsewhere in this Report. The Consolidated Statements of Operations and other data for fiscal years 2015 and 2014 and the Consolidated Balance Sheet data as of November 30, 2016, 2015 and 2014 have been derived from our Consolidated Financial Statements that are not included in this Report. The Consolidated Statements of Operations data include the operating results from our acquisitions from the closing date of each acquisition. Historical operating results are not necessarily indicative of the results that may be expected for any future period. Please see “Management’s Discussion and Analysis of Financial Condition and Results of Operations” and Notes 2 and 3 to our Consolidated Financial Statements included elsewhere in this Report for a discussion of factors, such as business combinations and the adoption of new accounting guidance, that affect the comparability of the following selected consolidated financial data. The following discussion and analysis of our financial condition and results of operations should be read in conjunction with Selected Consolidated Financial Data and the Consolidated Financial Statements and related Notes included elsewhere in this Report. When used in this Annual Report on Form 10-K, or this Report, the words “believes,” “estimates,” “expects,” “allows,” “can,” “may,” “designed,” “will,” and similar expressions are intended to identify forward-looking statements. These are statements that relate to future periods and include statements about market trends, our business model and our services, our market strategy, including expansion of our product lines, our infrastructure, our investment in information technology, or IT, systems, our employee hiring, the ownership interest of MiTAC Holdings Corporation, or MiTAC Holdings, in us and its impact, our revenue, our gross margins, our operating costs and results, the value of our inventory, competition with Synnex Technology International Corp., our future needs for additional financing, the likely sources for such funding and the impact of such funding, concentration of customers, our international operations, foreign currency exchange rates, expansion of our operations and related effects, including our Concentrix business, our strategic acquisitions and divestitures of businesses and assets, including our acquisition of Convergys and the impact of the acquisition on our business, revenue, cost of revenue and gross margin, our goodwill, seasonality of sales, adequacy of our cash resources to meet our capital needs, cash held by our foreign subsidiaries and repatriation, changes in fair value of derivative instruments, adequacy of our disclosure controls and procedures, pricing pressures, competition, impact of economic and industry trends, impact of our accounting policies and recently issued accounting pronouncements, impact of inventory repurchase obligations and commitments and contingencies, our effective tax rates, our share repurchase and dividend program, and our securitization programs and revolving credit lines, our investments in working capital, personnel and our succession planning, facilities and operations. Forward-looking statements are subject to risks and uncertainties that could cause actual results to differ materially from those projected. These risks and uncertainties include, but are not limited to, those risks discussed herein, as well as the seasonality of the buying patterns of our customers, concentration of sales to large customers, dependence upon and trends in capital spending budgets in the IT, and consumer electronics, or CE, industries, fluctuations in general economic conditions and risks set forth under Part I, Item 1A, “Risk Factors.” These forward-looking statements speak only as of the date hereof. We expressly disclaim any obligation or undertaking to release publicly any updates or revisions to any forward-looking statements contained herein to reflect any change in our expectations with regard thereto or any change in events, conditions or circumstances on which any such statement is based. For an understanding of SYNNEX and the significant factors that influenced the Company’s performance during the past three fiscal years, the following discussion should be read in conjunction with the description of the business appearing in Item 1 of this Report and the consolidated financial statements, including the related notes and schedule, and other information appearing in Item 8 of this Report. We derive our Technology Solutions revenue primarily through the distribution of peripherals, IT systems, system components, software, networking, communications, security equipment and CE and complementary products, and the delivery of servers and networking solutions for our design and integration solutions customers’ data centers. In our Concentrix segment, we provide high value business outsourcing services and solutions for customer engagement. Our customer contracts typically consist of a master services agreement or statement of work, which contains the terms and conditions of each program or service we offer. Our agreements can range from less than one year to over five years and are subject to early termination by our customers or us for any reason, typically with 30 to 90 days’ notice. In fiscal years 2018, 2017 and 2016, approximately 28%, 27% and 27% of our consolidated revenue, respectively, was generated from our international operations, and we expect this trend to continue. As a result, our revenue growth has been impacted, and we expect will continue to be impacted, by fluctuations in foreign currency exchange rates. The market for IT products and services is generally characterized by declining unit prices and short product life cycles. Our overall business is also highly competitive on the basis of price. We set our sales price based on the market supply and demand characteristics for each particular product or bundle of products we distribute and solutions we provide. From time to time, we also participate in the incentive and rebate programs of our OEM suppliers. These programs are important determinants of the final sales price we charge to our reseller customers. To mitigate the risk of declining prices and obsolescence of our distribution inventory, our OEM suppliers generally offer us limited price protection and return rights for products that are marked down or discontinued by them. We carefully manage our inventory to maximize the benefit to us of these supplier provided protections. A significant portion of our Technology Solutions cost of revenue is the purchase price we pay our OEM suppliers for the products we sell, net of any incentives, rebates, price protection and purchase discounts received from our OEM suppliers. Cost of products revenue also consists of provisions for inventory losses and write-downs, freight expenses associated with the receipt in and shipment out of our inventory, and royalties due to OEM vendors. In addition, cost of revenue includes the cost of material, labor and overhead for our systems design and integration solutions. In our Concentrix segment, cost of revenue consists primarily of personnel costs related to contract delivery. Revenue and cost of revenue in our Technology Solutions segment relate to products, and revenue and cost of revenue in our Concentrix segment relate to services. The Technology Solutions industry in which we operate is characterized by low gross profit as a percentage of revenue, or gross margin, and low income from operations as a percentage of revenue, or operating margin. Our Technology Solutions gross margin has fluctuated annually due to changes in the mix of products we offer, customers we sell to, incentives and rebates received from our OEM suppliers, competition, seasonality, replacement of lower margin business, inventory obsolescence, and lower costs associated with increased efficiencies. Generally, when our revenue becomes more concentrated on limited products or customers, our Technology Solutions gross margin tends to decrease due to increased pricing pressure from OEM suppliers or reseller customers. Concentrix gross margins, which are higher than those in our Technology Solutions segment, can be impacted by the mix of customer contracts, additional lead time for programs to be fully scalable and transition and initial set-up costs. Our operating margin has also fluctuated in the past, based primarily on our ability to achieve economies of scale, the management of our operating expenses, changes in the relative mix of our Technology Solutions and Concentrix revenue, and the timing of our acquisitions and investments. Our Technology Solutions revenue is highly dependent on the end-market demand for IT and CE products. This end-market demand is influenced by many factors including the introduction of new IT and CE products and software by OEMs, replacement cycles for existing IT and CE products, seasonality and overall economic growth and general business activity. A difficult and challenging economic environment may also lead to consolidation or decline in the IT and CE distribution industry and increased price-based competition. Business in our system design and solutions is highly dependent on the demand for cloud infrastructure and the number of key players in the market. Our Technology Solutions business includes operations in the United States, Canada, Japan and Latin America, so we are affected by demand for our products in those regions and the strengthening or weakening of local currencies relative to the U.S. Dollar. The customer engagement services industry in which our Concentrix segment operates is competitive. Customers’ performance measures are based on competitive pricing terms and quality of services. Accordingly, we could be subject to pricing pressure and may experience a decline in our average selling prices for our services. Our Concentrix business is largely concentrated in the United States, the United Kingdom, the Philippines, India, Canada, China and Japan. Accordingly, we would be impacted by economic strength or weakness in these geographies and by the strengthening or weakening of local currencies relative to the U.S. Dollar. During the three-year period ended November 30, 2018, the economic environment was stable. The discussions and analysis of our consolidated financial condition and results of operations are based on our Consolidated Financial Statements, which have been prepared in conformity with generally accepted accounting principles in the United States (“GAAP”). The preparation of these financial statements requires us to make estimates and assumptions that affect the reported amounts of assets and liabilities, disclosure of any contingent assets and liabilities at the financial statement date, and reported amounts of revenue and expenses during the reporting period. On an ongoing basis, we review and evaluate our estimates and assumptions. Our estimates are based on our historical experience and a variety of other assumptions that we believe to be reasonable under the circumstances, the results of which form the basis for making our judgment about the carrying values of assets and liabilities that are not readily available from other sources. Actual results could differ from these estimates under different assumptions or conditions. We believe the following critical accounting policies involve the more significant judgments, estimates and/or assumptions used in the preparation of our Consolidated Financial Statements. Revenue Recognition. Revenue from our Technology Solutions segment is categorized as products revenue in our Consolidated Statements of Operations. Revenue from our Concentrix segment is categorized as services revenue in the Consolidated Statements of Operations. For the Technology Solutions segment, we generally recognize revenue on the sale of hardware and software products when they are shipped or delivered and on services when they are performed, if persuasive evidence of an arrangement exists, the sales price is fixed or determinable, collection of resulting accounts receivable is reasonably assured, risk of loss and title have transferred and product returns are reasonably estimable. Binding purchase orders from customers together with agreement to our terms and conditions of sale by way of an executed agreement or other signed document constitutes evidence of an arrangement. Where product acceptance provisions exist, assuming all other revenue recognition criteria are met, revenue is recognized upon the earlier of shipment/delivery for products that have been demonstrated to meet product specifications, customer acceptance or the lapse of acceptance provisions. We recognize revenue on a net basis on certain contracts, including service contracts, post-contract software support services and extended warranty contracts, where we are not the primary obligor, by recognizing the margins earned in revenue with no associated cost of revenue. For the Concentrix segment, we recognize revenue from services contracts when evidence of an arrangement exists, services are delivered, fees are fixed or determinable and collectability is reasonably assured. Service contracts may be based on a fixed price or on a fixed unit-price per transaction or other objective measure of output. Revenue on fixed price contracts is recognized on a straight-line basis over the term of the contract as services are provided. Revenue on unit-price transactions is recognized using an objective measure of output including staffing hours or the number of transactions processed by service agents. Customer contract terms can range from less than one year to more than five years. Revenue is reported net of any revenue-based taxes assessed by governmental authorities that are imposed on and concurrent with specific revenue-producing transactions. Business Combinations. We allocate the fair value of purchase consideration to the assets acquired, liabilities assumed, and non-controlling interests in the acquiree generally based on their fair values at the acquisition date. The excess of the fair value of purchase consideration over the fair value of these assets acquired, liabilities assumed and non-controlling interests in the acquiree is recorded as goodwill and may involve engaging independent third-parties to perform an appraisal. When determining the fair values of assets acquired, liabilities assumed, and non-controlling interests in the acquiree, we make significant estimates and assumptions, especially with respect to intangible assets. Critical estimates in valuing intangible assets include, but are not limited to, expected future cash flows, which includes consideration of future growth rates and margins, attrition rates, and discount rates. Fair value estimates are based on the assumptions we believe a market participant would use in pricing the asset or liability. Amounts recorded in a business combination may change during the measurement period, which is a period not to exceed one year from the date of acquisition, as additional information about conditions existing at the acquisition date becomes available. We continually seek to augment organic growth in both our business segments with strategic acquisitions of businesses and assets that complement and expand our existing capabilities. We also divest businesses that we deem no longer strategic to our ongoing operations. In our Technology Solutions business we seek to acquire new OEM relationships, enhance our supply chain and integration capabilities, the services we provide to our customers and OEM suppliers, and expand our geographic footprint. In our Concentrix segment we seek to enhance our capabilities and domain expertise in our key verticals, expand our geographic footprint and further expand into higher value service offerings. We are also strategically focused on further increasing our scale to support our customers. On October 5, 2018, we acquired 100% of Convergys Corporation, ("Convergys”), a customer experience outsourcing company for a purchase price of approximately $2.3 billion. The acquisition is related to the Company's Concentrix segment and is expected to add scale, diversify revenue base, expand our service delivery footprint and strengthen our leadership position as a top global provider of customer engagement services. Convergys contributed $439.4 million approximately in revenue during fiscal year 2018. On September 1, 2017, we acquired the North America and Latin America distribution businesses, or the Westcon-Comstor Americas business, of Datatec Limited ("Datatec"), for an initial purchase price of $633.6 million. The acquisition is related to our Technology Solutions segment and strengthens our line card in the security, UCC and networking markets, enhances our North American position by adding complementary OEM vendors and reseller customers and expands our footprint into Latin America. On July 31, 2017, we acquired Tigerspike, a digital products company specializing in strategy, experience design, development and systems integration, for a purchase price of $67.0 million in cash. The acquisition enhanced Concentrix' digital and mobility competencies by providing improved business intelligence and performance for its clients through enabling technologies that are designed to create effortless, personalized end-user engagements. On August 1, 2016, we acquired the Minacs group of companies (“Minacs”), which provide integrated business process outsourcing services, for a purchase price of $429.1 million in cash. We believe the acquisition provides greater scale and strengthened our position as a top global provider of customer engagement services, enhanced domain expertise in Concentrix’s automotive industry vertical and accelerates Marketing Optimization and Internet of Things solutions with Minacs’ proprietary technology. With the acquisition of Convergys, our products revenue and cost of revenue in fiscal year 2019 are expected to decrease as a percentage of total revenue with corresponding increases in services revenue and cost of revenue. Additionally, our gross margin and operating margin are expected to increase due to the higher margins in our Concentrix segment which represents our services revenue. Revenue in constant currency, which is revenue adjusted for the translation effect of foreign currencies so that certain financial results can be viewed without the impact of fluctuations in foreign currency exchange rates, thereby facilitating period-to-period comparisons of our business performance. Revenue in constant currency is calculated by translating the revenue of fiscal years 2018 and 2017 in the billing currency using their comparable prior year’s currency conversion rate. Generally, when the dollar either strengthens or weakens against other currencies, the growth at constant currency rates or adjusting for currency will be higher or lower than growth reported at actual exchange rates. Non-GAAP operating income, which is operating income, adjusted to exclude acquisition-related and integration expenses, restructuring costs and amortization of intangible assets. Non-GAAP operating margin, which is non-GAAP operating income, as defined above, divided by revenue. Adjusted earnings before interest, taxes, depreciation and amortization, or adjusted EBITDA, which is non-GAAP operating income, as defined above, plus depreciation. Non-GAAP diluted earnings per common share (“EPS”), which is diluted EPS excluding the per share, tax effected impact of (i) acquisition-related and integration expenses, (ii) restructuring costs, and (iii) amortization of intangible assets, and the per share amount of the net impact of the adjustments related to the Tax Cuts and Jobs Act of 2017. We believe that providing this additional information is useful to the reader to better assess and understand our base operating performance, especially when comparing results with previous periods and for planning and forecasting in future periods, primarily because management typically monitors the business adjusted for these items in addition to GAAP results. Management also uses these non-GAAP measures to establish operational goals and, in some cases, for measuring performance for compensation purposes. As these non-GAAP financial measures are not calculated in accordance with GAAP, they may not necessarily be comparable to similarly titled measures employed by other companies. These non-GAAP financial measures should not be considered in isolation or as a substitute for the comparable GAAP measures and should be used as a complement to, and in conjunction with, data presented in accordance with GAAP.